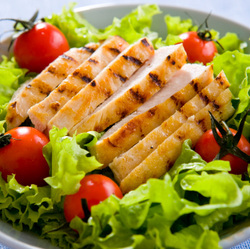 Use left over chicken to make a refreshing lean and green meal for lunch or dinner! Place salad greens on plate. Add veggies and chicken. Top with dressing. NOTE: This recipes makes ONE Lean & Green meal.